What is the Dofus Touch game? 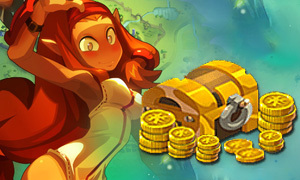 Dofus Touch is a cartoon style 2D online mobile game developed by Ankama Studio in 2016. Features all elements of cute images, magnificent magic effect, friendly social contact and recreation, Dofus was recognized to suit for all ages of players. As the authentic adapted version on iOS and Android, Dofus Touch inherited most of gameplay and equal excellent graphics from its PC version Dofus, providing another possibility for MMO gamers to enjoy the cute role-playing game freely. You can still find your favorite classes Feca, Sram, Ecaflip, Cra and more, to continue your conquering road in The World of Twelve, where resident with 12 gods. Why should players buy Dofus Touch Kamas from Joymmo.com's shop? Joymmo.com keeps running our site with strict screening mechanism, to ensure all of Dofus Touch Kamas on sale improving with their diversity service and competing price. More than 10 years professional experience is involved in game currency business! Customer oriented and 100% satisfactions is our goal.